810 Caroline Street 3 Fl. Thurs. 12-7 pm / Fri. & Sat. 12-9 pm and by appt. Eyeclopes Studios is located in Historic Downtown Fredericksburg, Virginia at 810 Caroline 3 Floor. Currently I exhibit shows every quarter, I am reviewing art for my Spring Show Opening The First Friday in March. 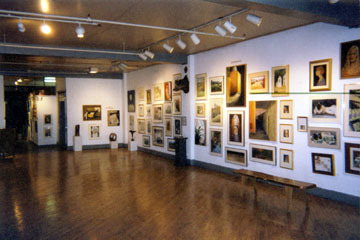 The Art Gallery is the only Gallery in Town where an individual can view art from 50+ feet away, we are the only gallery that can hang large pieces of art. Please remember that not all patrons have the space to display such large works. 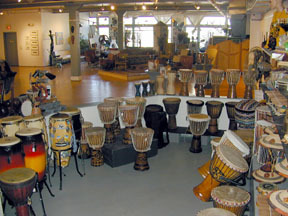 Also in the Gallery is Virginia's Best Hand Drum Shop featuring drums from Ghana, Senegal, Guinea, Mali, Ivory Coast, Latin Percussion, and Middle Eastern traditions. visit the Drum Shop and Gallery! Copyright 1991- 2006 Eyeclopes / Ken Crampton - All Rights Reserved.